Summary: An ABA survey finds 76% of community banks believe that social media is important to their bank. But, finding the right customers and converting them through social media is easier said than done. Sharks are normally really scary with all of their big teeth and ferocious appetites. But, consider a variety of shark known as the bonnethead that appears to be vegan! 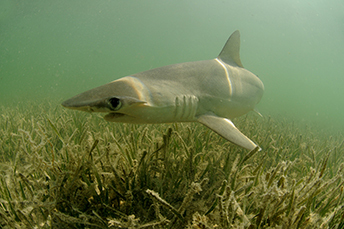 Yes, you heard us right - this shark eats seagrass from the bottom of the ocean and avoids other animals entirely. It is truly strange and obviously nothing for humans to fear. As that swims around in your brain, let's shift gears to a discussion on social media marketing by community banks. An ABA survey finds 76% of banks (95% of which had assets under $10B) believe that social media is important to their bank. Not surprising, since 65% of online customers use the internet for research and 82% of smartphone owners use their phones while in a business to help them decide on a purchase. Yet, using social media effectively requires a plan of attack that can attract the attention of individuals who may not be familiar with your bank. Even with a plan, you still have to ultimately convert some of them into customers. So, how can your bank be more successful at social media marketing? According to Salesforce, the average person needs to engage with your brand up to 8x before they are willing to commit to becoming a customer. This means you must have enough relevant content to keep them engaged over and over and over again. This can and should include industry-related information, small business blogs and of course, products and services. Remember, though, social media is not just a two-way street between you and the customer. Consumers themselves are mentioning and recommending companies and services in various posts and tweets to their own social network as well. The key to success is to look beyond your own contacts to what your customers are saying to others, to truly stay embedded. Banks that are highly engaged can leverage this information to broaden their online community and potentially bring in brand influencers and customers. According to Gremlin Social, a social media benchmark assessment service, 77% of consumers are more apt to buy a product when a friend has mentioned or recommended it. Your team just has to find those friends. Of course, before you commit to a specific social media channel, you'll want to ensure that it is the best one for your bank's prospects. To do this, you can test things across multiple platforms and then analyze the interest generated. You can and should use analytical tools, such as Google Analytics, and adjust as you go to attract those customers you want to attract. While social media allows you to reach more potential customers, communicating with them directly is still the best way to convert them. Once you have gained initial interest, you will want to capture their emails for a more direct connection. This can be done by asking them to provide their contact information to access your online content or a downloadable resource. Still a few more ways you can be effective with your social media marketing: add a signup button to your social media advertising or to the content you provide; monitor any online feedback; regularly add new content to create a relationship with potential customers; help familiarize them with your brand and show them you care about the community. The ABA reports that 89% of Americans rate their bank as good, very good or excellent while 86% rate their bank's security and fraud prevention measures as good, very good or excellent. According to a survey by Bank Director, when asked how their bank's compensation and hiring practices have changed over the past 3Ys to attract and retain younger talent: 47% said they increased salaries to be competitive with other industries; 44% have increased their employee training resources; 30% communicate career paths; 28% increased community/volunteer initiatives. Digital Banking Report research finds 80% of financial institutions surveyed said it was vital to provide customers with real-time, customized guidance and 76% said doing so had a "major" or "strong' impact on relationship building.